From 8th to 16th March 2019 ZSO No. 6 hosted the students and teachers of our partner schools from Germany, Italy and Slovenia. It was the final, fourth youth exchange organized as part of the Erasmus+ "Speak up, even if your voice shakes" project. The culminating event marking the end of our one hundred people strong project team's two-year work was "Musketeers of Words" Polish High School Oxford Debate Championships in English. Our preparations for the competition started in January 2019 and they involved work on the Speak Up Debating Society Twinspace and extra classes at all schools. Our guest speaker in Bydgoszcz was Mr Miha Andrič, an international debate coach and adjudicator from Slovenia, who gave a lecture on debates and savoir-vivre. He also conducted a series of workshops on argumentation and debate case building. Ms Monika Izbaner ran workshops on debate assessment and role fulfillment. During the "Musketeers of Words 2019" tournament Erasmus+ and Speak up were represented by four national and one international team. All of them demonstrated excellent debating skills and the team of Gimnazija Bežigrad: Peter Kenda, Eva Zagoričnik, Urša Štefan and Lea Bernik, we are delighted to announce, won the championships. We are also immensely happy with the fourth place of the Italian team, Paolo Palladio, Antonio Giulio De Simone, Armando Somma and Emilia Alessandra Di Vuolo as well as the achievements of Patryk Jankowski - the best speaker of the tournament, Antonio Giulio De Simone - award for the progress he made in debating over the two days and Katharina Kirchner for delicate but at the same time witty rebuttal. Congrats to all the debating teams and their coaches! The stay in Bydgoszcz was not all about learning and public speaking though. In their free time the participants enjoyed the numerous attractions of our city. To promote Polish cultural heritage we also oganized two trips, to Gdańsk, Sopot and Toruń. We listened to an organ concert at Oliwa Cathedral, we visited the Nicholas Copernicus House and the Museum of Toruń Gingerbread. The mobility in Bydgoszcz closes our project, so we would like to thank all the students and teachers we shared the last two years with. It was an amazing adventure and a huge thank you to you all! Sunday December 9th marked the beginning of the third international exchange of the pupils and teachers involved in "Speak up, even if your voice shakes." The main focus of our meeting in Ljubljana were debates and diplomacy. The students participated in a series of lectures and workshops devoted to Oxford-style debate. Our speakers were Dr Izbaner and Mr. Miha Andrič, head coach of Bežigrad high school debate club, who gave a lecture on building arguments. The culminating event of the exchange was a model Oxford debate in mixed international groups. A definite highlight of our stay in Ljubljana were meetings with members of diplomatic corps of all the partner countries, a visit to an Italian Cultural Institute, German Embassy and a meeting with the Polish Ambassador and his wife at Gimnazija Bežigrad. Students and teachers also listened to a round-table discussion on diplomacy and its role in the 21st century. The entire project group also enjoyed a number of sightseeing activities: a city game in Ljubljana, a visit to Planica, Bled, Gingerbread Museum in Radovljica, Postojna Cave and Piran. For the Polish group, an unforgettable experience was the Western Slavic Christmas Event hosted by the University of Ljubljana Faculty of Arts. We would like to say a big thank you to the teachers and students of Gimnazija Bežigrad for their warm welcome and invite the whole project team to Bydgoszcz this spring. Winning streak continues for our project team! In October all the schools received European Quality Labels for "Speak up, even if your voice shakes". 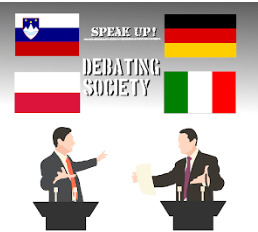 In September we set up our second eTwinning project called "Speak Up Debating Society." To visit its Twinspace, click here or on the logo on the right.